Georgia prospects D'Andre Walker & Deandre Baker discuss the upcoming NFL Draft. Mel's Big Board of Safeties. Which NBA teams could get upset in the first round of the playoffs? Plus, ESPN NFL Draft Expert Jim Nagy's surprising opinion on which prospect is overrated. Tiger is in serious contention at The Masters. Which NBA teams could get upset in round one? Plus, Mel answers NFL Draft questions. Dari & Mel chat with South Carolina head coach Frank Martin about the Final Four. Plus, the guys chat about the latest NFL Draft rumors. Dari & Mel react to the NCAA Tournament and what to look for today. Plus, Dan Dakich defends Tom Izzo's coaching style after coming under fire. The guys chat about the NFL Combine and when will Antonio Brown finally get traded. Plus, Ask Mel and Field Yates calls in. Geoff shares his combine "record". Plus, Antonio Brown takes zero blame for what happened with the Steelers. Dari and Geoff chat about the latest with Antonio Brown and talk Combine with Chris Mortensen. Plus, where have the treats gone? Dari is joined by Geoff Schwartz and they both believe Kyler Murray should go #1 to the Cardinals. Plus, the Hot List is players they would give 13 year contracts to. Mel gives his Big Board of OTs in this year's draft. Plus Jeff Darlington joins Mel and Matt from Foxboro for the latest on Robert Kraft. Matt Jones fills in for Dari and chats with Mel about Zion, the latest with Robert Kraft and of course, the NFL Draft. Dari & Mel chat about their NBA coach of the year candidates and Mel gives his big board for TE's. Plus, Dan Graziano & Sekou Smith. Callers Ask Mel their NFL Draft questions. ESPN NBA Insider Adrian Wojnarowski on the Anthony Davis and Kristaps Porzingis situations. Top 3 post-Super Bowl sports stories. Maria Menounos joins to discuss her Patriots fandom, and relationship with WWE. Plus, Mel Kiper's Big Board of Running Backs. Will Tom Brady's legacy be tarnished if the Patriots lose this Super Bowl? Porzingis got traded to the Mavs, but where will Anthony Davis end up? Jeff Saturday joins the show. Mel's Big Board: Top 5 QB's. Hero and Zero. Callers ask Mel Draft questions. Dari struggles to guess the 3rd hour musical theme. The next franchise to win multiple Super Bowls. Chris Doering checks in from the Senior Bowl. Dalen Cuff breaks down some CBB storylines. The Super Bowl is set, even though there was controversy last week. Who should you watch during the Senior Bowl? Callers "Ask Mel" questions about the Draft. Could Brady vs. Mahomes be a changing of the guard? Mike Detellier previews Rams/Saints. Is Tom Brady the best QB ever? Mel's Mock Draft 1.0. The Top 3 biggest surprises of the NBA season so far. Dari explains why the Big 12's grad transfer rule is absolutely ridiculous. It's Championship Week in the NFL. Mel calls Kyler Murray the most intriguing player in NFL Draft history. Kirk Morrison previews the Rams-Saints game. Dari and Mel finish up by updating the latest on the NFL playoffs and what to watch for in the Sunday games. Josina Anderson was live from LA getting ready for Cowboys-Rams and the Hot List looked at a college football team not named Clemson or Alabama that could win multiple champs. Dari and Mel get you ready for NFL divisional weekend, speak with former NFL lineman Jeff Saturday about the games and talk about the CFB transfer portal. Legendary Oklahoma Coach Bob Stoops drops by to talk about why coaches decided not to coach in the NFL in favor of staying in college. Jeff Darlington on Adam Gase's future. The top NFL players in the playoffs that are NOT quarterbacks. Former Alabama QB John Parker Wilson previews the National Championship. It's Wild Card week in the NFL! Jimmy Butler continues to cause issues on the teams he plays for. Plus, which songs do you always clap, sing, air guitar or air drum along to? Mel gives his impromptu Big Board of cakes. ESPN NBA Insider Adrian Wojnarowski explains what could happen with Anthony Davis. Mel is introduced to Josh Groban. Who will be the 3 best QB's 5 years from now? Jeff Saturday gives his thoughts on that, and breaks down Week 16. Previewing Week 16 of the NFL. What are Ben Roethlisbergers's Hall of Fame hopes like? Hero and Zero. Plus, Chris Fallica's weekly picks. The most off the rails hour of Dari & Mel in history. The top 3 Heisman candidates for 2019. Dari believes UCF needs Florida more than Florida needs UCF. Keith Law on Kyler Murray playing baseball vs. football. Louis Riddick on Philip Rivers being a Hall of Famer, and the Bears making the Super Bowl. Should the CFP be 8 teams? Scott Spreizer makes his picks for the week. Dan Orlovsky on the Heisman hopeful QB's, as well as Will Grier's decision to skip his bowl game. Chris Fallica's picks for the week. Mel's Draft Primer. The Best 3 bowl games outside of the CFP. Scott Spreizer's picks for the week. Plus, the triumphant return of Hero and Zero. Who should win the Heisman: Tua or Kyler? Did the CFP committee get the rankings right? Dari feels that UCF should explain how hard it is for them to book big time games. Dari and Mel talk about Kareem Hunt with Brooke Pryor of the KC Star. Plus, Scott Spreitzer gives his picks and the final thoughts heading into Championship games. The most disappointing NFL teams this season. Jeff Brohm chose not to go to Louisville. Mel's Big Board of NFL QB's. Todd Blackledge previews the Big 12 Championship. Kareem Hunt has been released by the Chiefs after a video was released of him attacking a woman in a hotel hallway. Brad Edwards previews the conference championship games. With so much on the line Saturday, Dari and Mel go through all the scenarios that could affect the CFP. Plus, Scott Spreitzer give his picks. Hot List on the Top 3 most disappointing teams/players in CFB. Which NFL teams are still in the playoff hunt? SEC Network's Chris Doering discusses the CFP. Friday night had some impactful CFP match-ups. Will Georgia struggle with Georgia Tech? Ian Fitzsimmons discusses CFP scenarios. Chris Fallica gives his picks for the week. Dari and Mel get picks from Scott Spreitzer and discuss NFL Coaches on the Hot Seat. Plus, How many teams should be in the CFP? The top 3 CFB assistant coaches, and what jobs they could potentially be taking. Dari's disdain for Kevin Durant continued. Mel gives his Big Board. This is a rough week in college football. Should Alabama sit or play Tua against The Citadel? Mike Golic Jr. on Notre Dame's season. Chris Fallica gives his pick for the week. Dari and Mel argue about if CFB or NFL is king. Plus, Todd (Todd, Todd) McShay joins the show and says don't count on Kyler Murray heading to the NFL as definite yet. The show becomes Mel and Mel. The next coach to win a National Championship. Can Boston College upset Clemson? More under the radar games. A look at the best CFB games of the day. This biggest flaw with Thursday Night Football. CFB Week 11 under the radar games. Chris Fallica's picks for the weekend. Chris Fowler joins the show from PSU vs MICH. Plus, Scott Spreitzer and Adam Rittenberg from ND vs Northwestern..
NFL teams most likely to win their 1st Super Bowl. What LSU needs to do to beat Alabama. Plus, more Under the Radar CFB games. #1 Alabama at #3 LSU is by far the biggest CFB game of the year up to this point, and potentially will shape the playoffs. Under the Radar games. Chris Fallica's weekly picks. More of the Under the Radar games. preview from Florida/Georgia & Texas/Oklahoma St. Plus, Heather Dinich on the upcoming CFP rankings. Game 3 of Dodger-Red Sox just ended, so the guys recap the game. A look of the top tier, and under the radar CFB games. Plus, Chris Fallica's picks for the week. Chris "the Bear" Fallica gives his picks for the week. The guys go through their early takeaways from the NBA season. More CFB game previews. The guys look at the 4 biggest CFB games of the day, ad well as some of the under the radar matchups. Mel is frustrated by the "touching the passer" penalties in the NFL. Mel wants an expanded CFP. Ian Fitzsimmons joins the show to preview UGA vs LSU. Plus, Tim Kurkjian talks Championship Series. Dari & Mel go through some under the radar CFB games. Plus, Mel compares the 4 NFL rookie QB's to retired baseball players. The guys take a look at some of the big CFB games of the day, as well as preview Week 6 of the NFL season. Plus, Chris "The Bear" Fallica gives his picks for the week. Dari and Mel chat baseball playoffs with Buster Olney. Scott Spreitzer gives his picks (and he is red hot) and the guys preview other games in CFB. Which 3 CFB teams with one loss could still make the playoffs? SEC Network's Chris Doering joins the guys to preview week 6 of the CFB season. The guys take a look ahead to the 3 biggest CFB games this season and look back at week 4 of the NFL season. Plus, Chris "The Bear" Fallica gives his picks for the week. The guys go through their early NFL MVP candidates. Can Penn State beat Ohio State? Plus, are the new tackling penalties bad for the NFL? The guys preview the 3 biggest games of the day: OSU/PSU, ND/STAN and BYU/WAS. Chris "The Bear" Fallica gives his picks for the week. Which blue bloods do the guys want to see return to power? Chris Fallica gives his picks for the week, and Chris Doering previews some of the Week 3 games. The guys preview some of the CFB Week 3 matchups. Baker Mayfield lead the Browns to an improbable win over the Jets, and Carson Wentz is returning vs. the Colts. The guys overreact to week 1 of the NFL. How does TCU beat OSU? Plus, UCF Head Coach Josh Heupel thinks McKenzie Milton could be the next Drew Brees. The guys preview some of the big Top 25 match-ups, as well as some of the underrated games of the week. Plus, Chris "The Bear" Fallica updates the lines. The guys go through some of their biggest reactions to the CFB season thus far. Mark Schlebach previews Georgia vs. South Carolina. The guys take a look at week 2 of the CFB season, including some of the match-ups that nobody else is talking about. Chris "The Bear" Felica gives his picks for the week. Dari and Mel talk with Adam Schefter and Tom Waddle about the Mack trade. Plus, under the radar CFB games and Scott Spreitzer. BREAKING: Khalil Mack has been traded to the Bears. Also, which college coaches have the most to prove this season? The guys react to yesterday's games, and look ahead to some of the big match-ups of the day, such as Michigan-ND and Washington-Auburn. Plus, Chris "The Bear" Felica. The guys make their NFC picks as well as their NFL playoff picks. Then they make their CFP picks and take calls on their selections. Dari and Mel give their Hero and Zero of the Week. They preview the BIG 10, BIG 12 and PAC 12. The guys preview the SEC and chat with Chris Doering of the SEC Network. Plus, the Hot List: Top 3 teams that will make the NFL playoffs after missing last year. Mel is back and we start our conference Previews with the ACC. Plus, Andrea Adelson joins the show. Quick Question, Hero and Zero and Michael Collins joins the show. The HOT LIST: Most Interesting teams this NFL season. Jay Bilas and Heather Dinnich join the show. Dari is joined by Myron Medcalf and they (over)react to Week 1 of preseason games. Monday Night Football's Booger McFarland joins the show. Dari and Adam give their list of most interesting teams in CFB heading into this season. Plus, NFL Nation reports from the Bengals and Titans. Dari and Adam Rittenberg are joined by Dan Murphy who interviewed Zach Smith Friday. Plus NFL Nation reporters from the Texans and Bills. Matt Jones & Myron Medcalf filling in. Courtney Cronin joins to talk Vikings, plus the guys discuss the greatest father-son duos. Matt Jones & Myron Medcalf filling in. What are the best father-son duos in NBA history? Plus, KD vs. CJ McCollum Twitter feud has been entertaining. Matt Schick & Myron Medcalf talk about the marketing of players in MLB, Larry Fedora's comments on CTE and what's next for Carmelo. Matt and Myron talk to Tom Haberstroh and Marc Spears plus put together the Hot List and Hero and Zero. Matt and Myron talk to Brett Okamoto, play Quick Question and Matt dramatically reads Myron's texts on LeBron. Matt Schick and Myron Medcalf are in for Dari and Mel looking at Kawhi Leonard moving or not moving and Taylor Twellman on the World Cup. Dari & Booger McFarland talk about the World Cup and watching games at viewing parties. Plus, Booger talks about the one time he played soccer. Aaron Goldhammer & Nick Freidell talk about who the Finals MVP should have been & who could knock off the Warriors. Plus, Dave McMenamin. Dari and Mel talk about the NFL's anthem decision, speak to Stephen A. Smith on the NBA and play Quick Question. Dari and Mel marvel at LeBron's efforts last night but Mel feels Michael Jordan is still the greatest. Bobby Marks gives his thoughts on the Conference Finals. Quick Question. Hero and Zero Plus, What kind of impact will sports betting have on the games? Dari and Mel talk to Brian Windhorst about the NBA Playoffs and Lebron's future. Plus, a heated debate on Robinson Cano and PED's. We check in on Dari and Mel's conference Finals predictions. The Hot List on what we would like to see in the NBA playoffs. Liam's mum calls in to discuss the Royal Wedding. Dari & Mel previewed the Eastern and Western Conference Finals. Plus, did Dwane Casey deserved to be fired? Westbrook isn't a fan of Jazz fans. Dave Rothenberg isn't a fan of the Giants drafting Barkley, and who was this week's hero and zero? The Hot List, Bill Barnwell and will Aaron Goldhammer eat poop? Chris Doering in for Mel today. The Cavs are in trouble, Westbrook doesn't like Jazz fans, and the NFL draft has been crazy. Dari & Mel talk about the 76ers and Joel Embiid and what they've done in the playoffs so far. Plus, Kiper's Callers and Mike Reiss. Dari & Mel reacted to the Cavs losing game three and the the heated game between Washington and Toronto. Plus, NFL Nation takeover with Tim McManus & Jenna Laine. Dari & Mel talk about the NBA playoffs and what will happen in the NFL draft. Plus, Marc Kestecher. Dari & Mel do their Hot List, Hero & Zero and Kiper's Callers. Plus, Boog Sciambi on the Yankees. Dari & Mel talk about the NBA playoffs and what the Cowboys will do after releasing Dez Bryant. Plus, Bobby Marks. Dari & Mel talked to Dino Gaudio about the NCAA Tournament and AJ Hoffman on the Rockets winning streak ending. Plus, is Tiger Woods back? Chris Mortensen talks Combine and Kirk Cousins Sweepstakes. Plus "Hero or Zero" and round 2 of "Kiper's Callers." Dave Revsine of the Big Ten Network joins the show to talk Tourney season. Following the "Hot List" & "Kipers Callers," we debate which CBB teams aren't getting enough credit. With the NFL Combine on-going, Mel breaks down the QB's in attendance. Stephen A Smith talks NBA. Plus, would Dari change the NBA Playoff format? Dari & Mel talked about the FBI's investigation into college basketball and the impact that will come from it. Plus, Mark Schlabach on Sean Miller & Arizona. Dari & Mel chatted with Joe Lunardi to get his thoughts on the NCAA Tournament. Plus, former USC running back Ronald Jones II. Dari & Mel made their way too early predictions for the college football next year. Plus, they chatted with Larry Krueger about the 49ers. Dari & Mel previewed the Super Bowl and what a 6th title would do for Tom Brady. Plus, they chatted with Ellis Hobbs who played for both the Eagles & Patriots. 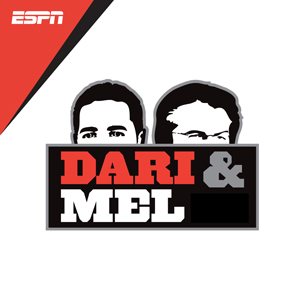 Dari & Mel talked about Boogie Cousins getting injured, the XFL making a return after failing the first go around and the Senior Bowl. Dari & Mel previewed the AFC Championship Game with Ben Volin & MIke DiRocco. Plus, Dari chatted with Arizona running back David Johnson. In reaction to the breaking news that iconic CFB announcer Keith Jackson passed away, Dari and Mel play some of his famous calls and remember his legacy.